Well, there you have it. The Matrix Orbital MX610 proved to be a quality piece of hardware that would accent any PC lucky enough to house it. While I am left impressed, the MX6 does not get off so easily. There are some problems that I would like to see addressed. The first glaring complaint that I have is not so much with the MX6 itself, but the software needed to run it. LCDC is an extremely robust piece of software but is very complex. I understand that only a handful of people have actually worked on the software and that is its greatest downfall, and greatest advantage. For most people who might order the MX6, it is assumed that they have a bit of technical prowess to them. Then there are others who do not possess this ability to work with software, trust me, I work with many. I would love to see this software made more user friendly, but in a way that still captures all of the usefulness that it already possesses. LCDC is great for those that can master it. As for my other complaints, it’s just me nit-picking. I would love to see a full, longer frame. I was able to put the MX6 onto the bay mounts but with only one screw in them, the unit was prone to tilting one way or another. This is easily fixed by screwing down the screws really hard. All in all, the MX610 lived up to my expectations and with the help of the extremely robust LCDC; it far surpassed those expectations entirely. Well folks, we are at the end. The MX6 has proven to be a very nice add-on for anyone’s PC. It not only looks nice but the functionality of the unit is amazing as well. 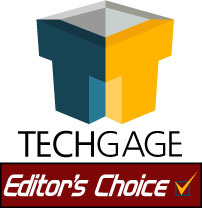 I am awarding the Matrix Orbital MX610 a well deserved 9 out of 10 as well as this editor’s choice. The MX6 is a superb example of what a PLCD display should be and then some. The only thing keeping this from getting a perfect 10 is the steep learning curve of the software. Most people can catch on but I guarantee there will be many people pull their hair out trying to get this up and going. If you should have any trouble, drop me a line in the forums and I will be more than happy to help.